Sneezeweed is in full bloom right now in my landscape. 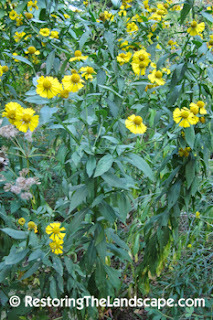 Its bright yellow petals are unique with their 3 soft lobes at the tips. The petals and large rounded center, gives the whole flower an interesting look. 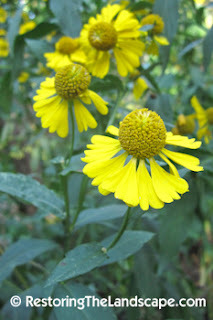 Sneezeweed is a native perennial of sunny, moist locations. Often growing just upland from rivers or creeks as well as wetlands. It is very adaptable in the managed landscape, performing well in medium soils too. 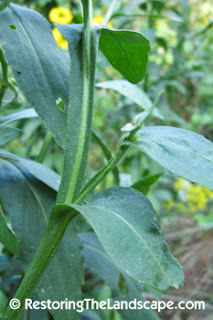 Another distinguishing feature is the flower stem, which is flared as though the leaf is continuing down from where it attaches. A similar feature of Wingstem. Sneezeweed is a tall native, this year it's almost 5 feet tall in my yard. It tends to range in height between 2 and 5 feet, depending on rainfall and soil moisture. It stays upright and is narrow through the lower parts of the stem, then branches at the top forming the flower heads. 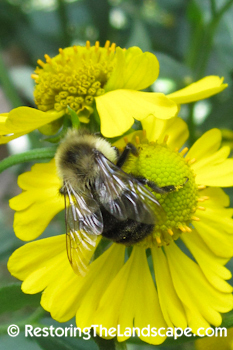 Sneezeweed flowers are an important source of late season pollen and nectar for bumble bees. Syrphid flies also like to nectar on Sneezeweed. Sneezeweed is native to most of North America. See map below.